The piers that still exist would be disconnected from land. There's no use for a pier that the public can't get to or that a ship's crew couldn't get to without a boat. 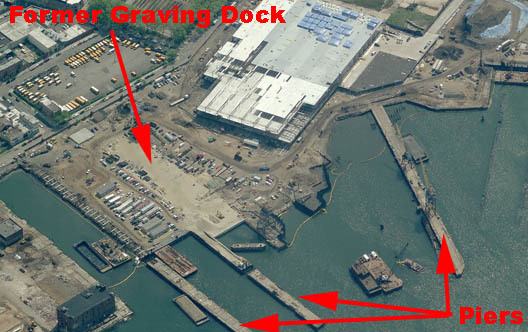 If Ikea severs those piers, we'll never get a permit to build them back and that infrastructure will be lost. This new permit gives us another chance to ring in. 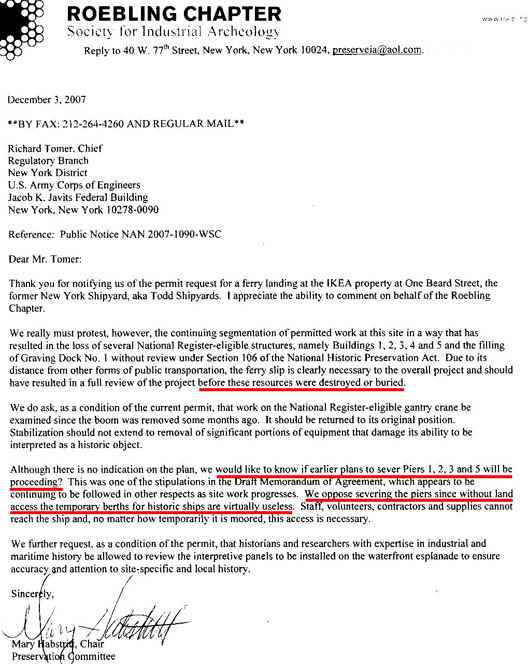 It is a different type of permit requiring public comment, thus the notice. Of course, all the buildings are now gone and Graving Dock No. 1 is filled. But maybe we can keep the piers from being severed and maybe influence the development of the esplanade. Assuming they haven't already been chopped. A letter from the Roebling Chapter of the Society for Industrial Archeology is below. You can view an image of the letter to the Army Corps from the Waterfront Museum by clicking here. Instead of just focusing on the negative, it would have been great if you could have examined the good news - that Ikea is planning a ferry dock. That means less vehicle traffic through our neighborhoods...and renewed use of the waterfront by regular New Yorkers, not just long shoremen who live in New Jersey.